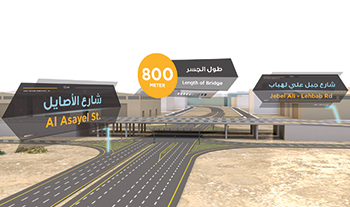 A concept of the bridge on Jebel Ali-Lehbab and Al Asayel roads intersection. Dubai’s Roads and Transport Authority (RTA) has awarded contracts worth Dh630 million ($172 million) for the construction of roads and transportation systems in connection with the upcoming Expo 2020 mega event. These include the last two phases (Five and Six) of the roads leading to the Expo site, and involve improvements to both Jebel Ali-Lehbab Road and the intersection of Emirates Road with Jebel Ali-Lehbab Road. In line with the directives of HH Sheikh Mohammed bin Rashid Al Maktoum, Vice President, Prime Minister and Ruler of Dubai, over the past few months, RTA had awarded four contracts for the improvement of roads leading to the Expo project. Phases One and Two included contracts for improving Jebel Ali-Lehbab Road and the intersection with Sheikh Mohammed bin Zayed Road. These two phases also included the construction of bridges on Sheikh Mohammed bin Zayed Road to serve the traffic from and to the Expo 2020, it added. “Phase Five covers the construction of bridges extending 2.6 km, and roads running up to 3 km. Jebel Ali-Lehbab Road will be widened from three to six lanes in each direction over a 3 km sector, and service roads will be built to improve the current traffic situation,” he noted. At the intersection with Al Asayel Road, Jebel Ali-Lehbab Road will be elevated to a bridge spanning 800 m of six lanes in each direction. According to him, Phase Six covers the improvement of roads leading to the Expo encompassing the construction of bridges extending 1.4 km and 8 km of roads.